Boutique Baby glitz bibs featuring designer fabrics on all bib fronts. 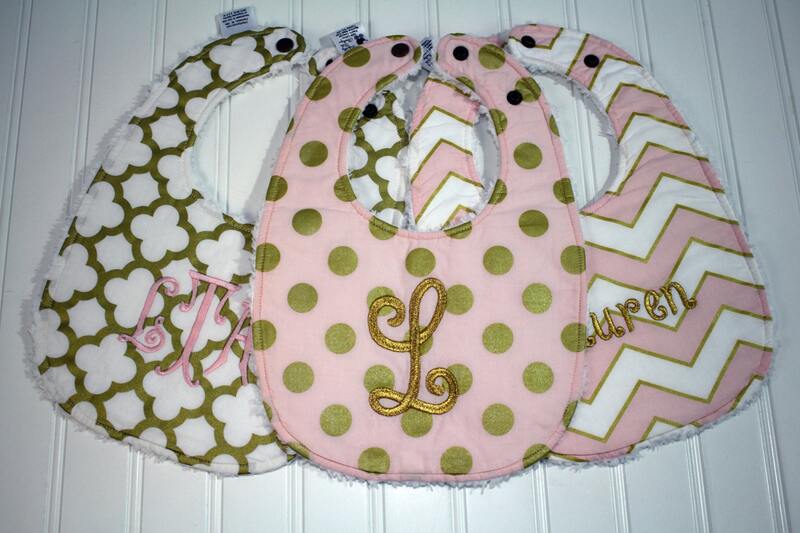 These bibs are made from the Michael Miller Confection Glitz fabric featuring Gold metallic in chevron, dots, or white and gold quatrefoil. Choose to personalize your baby bibs with either a name, letter, or monogram. The reverse is a super soft & absorbent chenille fabric to keep baby extra dry & comfortable. Triple layered. Fully lined with 100% cotton "Warm and White" absorbent batting. Two snap-downs on the front of the bib so you can easily adjust the bib size as your baby grows. - Hand crafted in a smoke and pet free studio. Infantly Cute Boutique products are made with the highest quality of materials. Fabric placement may vary. We take pride in the careful attention to detail we put into every item made. Adorable!! Great quality bib and embroidery, a great gift!! Amazing. As always. This is my go-to baby shower gift. Amazing customer service and everything arrived quickly. Love this store.